It’s no secret that Google dominates the search engine market share. As their share continues to grow month over month, companies are buying more ads, and people are increasingly clicking on those ads. According to The Wall St. Journal, Google’s revenue from advertising rose to $21.5 billion in the second quarter of 2016. That’s a lot of money. Would Google like to make more? Of course, but there’s something else they care about – relevancy. It’s in Google’s best interest to show the most relevant search results possible. It’s what keeps their market share growing. So how does Google balance revenue and relevancy? That’s where quality score comes in. 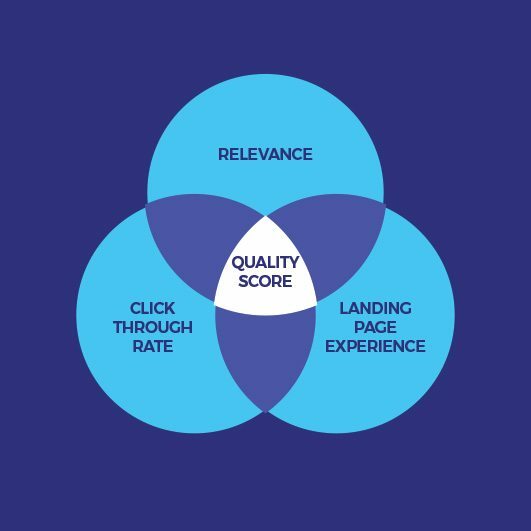 The more relevant your ads and landing pages are to the user, the higher your quality score. How Can a High Quality Score Save You Money? Most people assume that the highest bid gets the top spot, but that’s not how the Google AdWords auction system works. In order to maintain relevancy in their search results, Google uses something they call Ad Rank. Ad Rank is your bid multiplied by your quality score. If you have the highest Ad Rank of all the advertisers in the auction, your ad will be in the top spot. If it’s too low, your ad may not show at all. The higher your quality score, the less you have to bid to obtain the same Ad Rank. This is why Quality score is especially important for small businesses and advertisers with a limited budget. If you put time into optimizing your account, you can end up in higher positions than your competitor even if your bid is less. Now that you understand quality score and how important it is, it’s time to take some action to boost your score. One of the biggest mistakes new advertisers make is creating one ad group with a bunch of keywords that aren’t related to each other. Don’t make this mistake. Create tight ad groups and make sure the keywords in the ad group match your ads. Your ad copy should include the keywords you are targeting as well as content that is actually on your page. If you’ve followed the first tip and have tightly themed ad groups, you should be able to write relevant ads that speak to the keywords in the ad group. It’s not just about keywords. Anything you mention in the ad text needs to be on the landing page. Whether it’s a specific offer or benefits of your service, if it’s not on the page you’re not providing a good experience for the searcher. Not only will you lose out on a potential customer, you will pay with higher costs per click. Along with making sure the landing page is directly relevant to ad text and keywords, there are other steps you can take to improve landing page experience. Be transparent about what your business does and make sure your contact information is visible and easy to find. Be sure your page is easy to navigate. Don’t make users hunt for information and don’t annoy them with pop-ups while they’re browsing. Landing page optimization isn’t only essential to help quality score, it can improve conversion rate and lower your cost per acquisition. Those are key performance indicators (KPI’s) that you should always be looking to improve. Always have at least 2 ads per ad group to test against each other. When there’s a clear winner, pause the underperforming ad and write another ad to try and beat the winner. By doing this you should be rewarded with higher clickthrough rates, which lead to higher quality scores! Stop your ad from showing on non-relevant terms by adding negative keywords. If you sell mountain bikes but only sell them for adults, you don’t want someone who searches “mountain bikes for kids” seeing your ad. You would add kid, kids, child & children as negative keywords. Now whenever someone uses these words in their search, your ad won’t show. Doing this prevents wasted spend for you and prevents wasted time & frustration for the searcher. It’s a win-win. Site speed is important to Google because it is important to users. People are busy and generally impatient when it comes to waiting for a page to load. Having a slow loading site will not only hurt your quality score, it will cause potential customers to click away from your site and click on a site that loads faster. How fast should it load? According to Google, nearly half of all visitors will leave a mobile site if the pages don’t load within 3 seconds. Use Google’s PageSpeed Insights tool to test your site’s speed. You’ll get a grade and suggestions on how to fix issues that are slowing it down. Ad extensions give you more real estate on the search engine results page. They help you stand out from your competitors and improve your clickthrough rate. Higher clickthrough rates will help boost your quality score. Only use extensions that are relevant to your business. Spamming the results page with irreverent information is not good for your business or quality score. It’s important to keep in mind that quality score is there as a tool to help assess your account & if it’s deemed relevant to Google. It should not be something you use to measure the success of your campaigns. Having a 10/10 quality score on a keyword that does not convert for you is not going to do anything for your business. If you have the time to put into it, optimizing your account for quality score will save you money & allow you to compete with companies with much bigger budgets then yours. But a lot of business owners are already multitasking & simply don’t have the time manage their account properly. If that’s the case, consider hiring an agency like Efferent Media to manage the account for you. The management fee can be a lot less than the fees you will be paying Google for a poorly managed account. Learn more about Efferent Media’s Search Engine Marketing Services and how we can help your business get the highest quality score and lowest cost-per-acquisition possible. We don’t help Google make money. We help Google stay relevant.